What did you like about Darkest Dungeon? If you hated Darkest Dungeon, I'm not interested in hearing from you, only from those who liked (or so-so liked) it. As a Call of Cthulhu tabletop fan, I really enjoyed it, but I had a tough time connecting with it to continue playing. Same with sunless sea. The rogue like aspect kind of kept be from investing enough time in it to get too far into it. I dig the thematic and aesthetic. I liked it a lot. I still wonder how I've managed to like it so much knowing its undoubted repetitive nature ( I guess we've learned to fear repetition in gaming because real life became too repetitive). But it had atmosphere, a basic element that many modern games underestimate or perhaps their developers cannot agree what the word exactly means. The gothic, grim setting, the stylish visuals, the narrator, the lovecraftian theme (without being "one of the same"), the unforgiving odds (it was sadistic with you but it gave you a sense of accomplishment when you were finishing a mission at great risk), the micromanagement of the hamlet (it was great to build it from ruins), the risky decisions you had to take (permadeath was the central pillar of that) were the things that formed its atmosphere, at least according my taste. It could have made things better in certain areas (for example more plot would be great) but perfectionism can become an enemy of unpretentious joy, so I am okay with what it is. I really, really like it. Mostly because the complex system what was easy to learn. A lot of games have a complex system what is hard to learn. But games like Darkest Dungeon and Vagrant Story are very complex but easy to learn. Great atmosphere, very consistent: it chose a tone and stuck with it throughout. Nice lovecraftian setting. Good bit and pieces of a storyline building up if you care to follow them. High stakes: when you were feeling most confident, a enemy would reorder your group, destroying your strategy and maybe a character or three; but also powerful combos if you learned how to combine abilities to rip through a group of enemies in one turn or two. The BIG negative: it's too grindy. The cost of upgrades is too high, you need to play forever to get anywhere. I dropped it when I realized that after 40 hours I had barely scratched the surface of the campaign and a couple of achievements. I give it a try, right now and tell you soon. I like it very much. It reminds me of games workshop in a Lovecraft setting. The artwork is aawesome, the narators voice is awesome and the whole game is very amusing and entertaining to me. ...and challenging. I like the randomness of some game mechanics. I would love to see it getting even more expandet in some way. 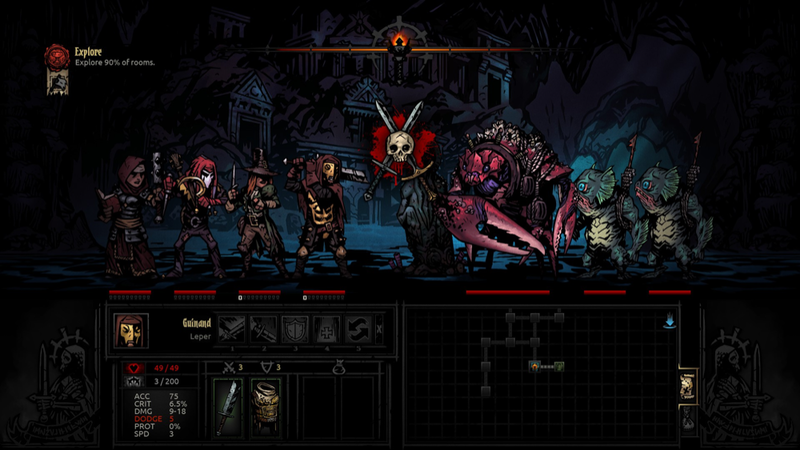 Darkest Dungeon isn't a game I will ever play through, but I do love what it does with the setting, the atmosphere and how the gameplay works. I do think the visual side of the game does a lot of it in terms of making it far more interesting than if it would be just a standard 3D game. Played for a couple of hours, a few years ago. I liked the external narrative voice, it was surrounding. Then, since it's not my genre, I stopped playing it, I regret. The cartoonish 2D graphic style. The athmosphere carried to al large degree by the excellent narrator. The well crafted combat system that was easy to learn yet offered many different ways to play the game and build a functional party. The way permadeath was implemented, which made risks have real meaning and resulted in no monster being just another pushover. Thus every fight had meaning and was a struggle. The fact that characters were impacted by their ordeals and needed time to recover and might even need therapy after fighting the darkest darkness. In short, I liked its comprehensive simulation of team building and leading in a project environment. Hey there. Sorry for hijacking this offtopic but since the TP-Blog is locked down and theres no post about it Im wondering what the deal with Epic is? I dont want to hate or anything and its a great way of spreading the game to new audiences but Im still wondering about your opinion on that? Maybe even some vague numbers? The art style and atmosphere (reminded me of Mike Mignola's Hellboy comics which I love) and the concept of player characters that rebel against your orders. It always seemed strange to me that characters would happily go to their death carrying out orders in RTS games. In practice having a character who is close to death refuse to accept healing or another character auto attack enemies they are to weak too defend against can be really annoying! It can get dangerously close to feeling like I failed a dungeon run because the game made it happen rather than my poor decisions. Of course if you have ever managed people in real life you'll know that you can do everything you can to try to succeed and they can independantly f**k it up! So I guess it's realistic in that sense. I constantly go back to it, but I quit when the crusader I rename after myself dies horribly of stress in a minor mission. I guess the most appealing thing for me is the team-building aspect combined with base building/upgrading. It's what kept me going in Xcom as well. I played a lot and it's for me the darksouls for roundbased games. I love it. The Style, the Story and the "characters" works for me very well. The DLC do not make the game any better as they sometimes interfere with the game mechanics. I liked atmosphere (Simon Bisley touch) and the endless combinations of buff/debuff/trinket/consumables. Overall sense of progression, albeit slow. Even if bad things happened I still felt I was making overall progress towards end game. i hardly played anything at that point, had been in a psychiatric hospital for a month shortly before, and was generally staying inside, trying to get to grips with this world. i got fully immersed in the ambience of it, which hadn't happened with anything for a while. got a feeling of warmth from this harsh feeling game, more than anything. like with the first diablo when it was fresh. chilly and warm at the same time. i think darkest dungeon has that 'minecraft' quality in the sense that it unimposingly reflects on what living on this planet is like. it's a dungeon out there, you're gonna get bruised. once you're considered damaged goods, you're very expendable. etc. for a game, it's as deep as it goes. What Simeon Zaharici said. I needed to +1 it. What is three + one + one?